Can I just use the built-in memory in the Mavic Air instead of a memory card? What size card is best? Do I need a super fast card? For still photos pretty much any card available today will be fast enough. For 4K video, you want to make sure you get one that is UHC 3 with a Video Speed Class rating of at least 30. Those numbers refer to the speed at which information is written to the card by your Mavic Air and from the card to your computer. Your Mavic Air Mavic can write to the memory card at 12.5 MB/s. A UHC 3 card can handle a minimum of 30MB/s, so you have a lot of headroom. A card like the SanDisk Extreme Pro advertises transfer rates of up to 100MB/s. That won't make any difference in writing video to the card, but it will be faster when you transfer the files to your computer. But we're talking seconds faster, not minutes. What's the best brand of card to get? I have not had issues with any brand I have used. 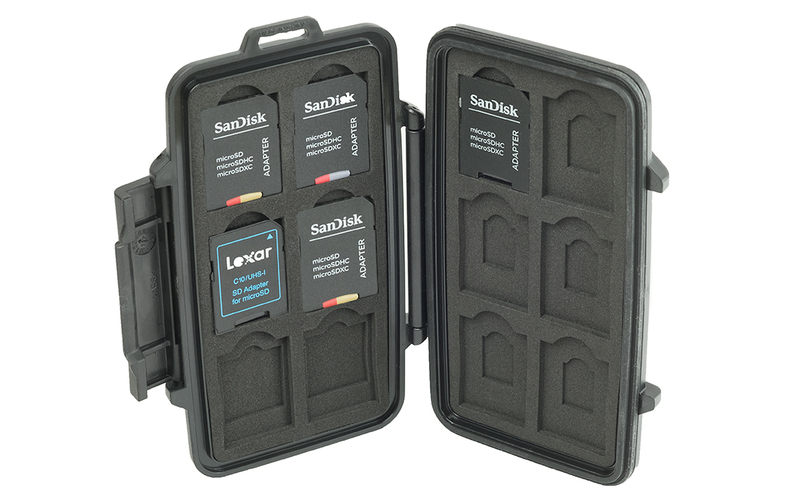 I tend to use SanDisk because they are widely available and reasonably priced. 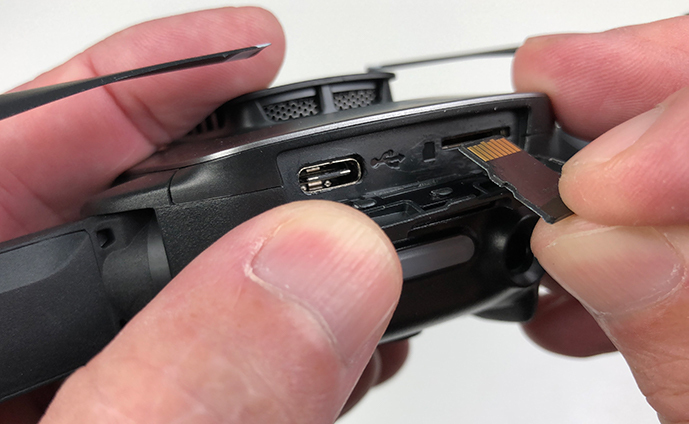 Where does the Micro SD card go on the Mavic Air? On the back of the Mavic Air, right above the status light, there is a little door that flips down. When you open it you will see a tiny slot on the right side. Insert the Micro SD card into the slot with the contacts on the card facing up. Now push it in all the way. It's a really tight fit because there is so little room. To remove the card, push on it with your fingernail then release. It will spring out a bit and you can try to pull it out the rest of the way. I can't get my fingers in that little space to grab it, so I use a pair of tweezers. How do I tell my Mavic Air where to store the images I shoot? Tap the Camera Settings icon on the right side of your screen (the three horizontal lines with circles located under the shutter button). Now tap the gear icon at the top right then scroll down. Tap on Storage Location and select the either Internal Storage or Micro SD card. How do I get the images and video onto my computer? Take the card out of the Mavic Air and insert it into a card reader that is connected to your computer. It will show up as an external drive. You can then just grab the files you want and drag them into a folder on your computer. 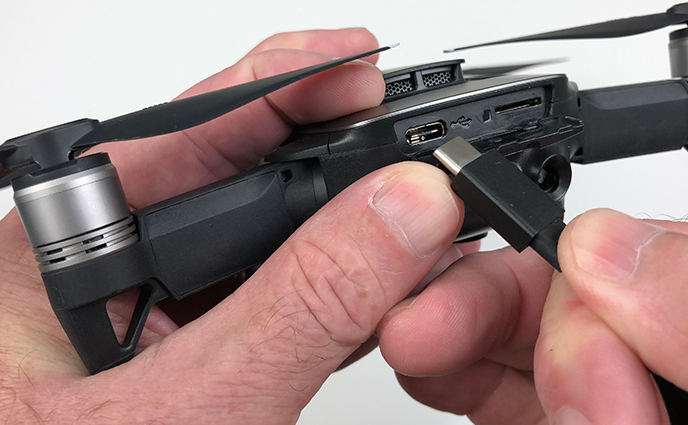 Open the door on the back of the Mavic Air and plug the USB-C end of the cable into the port to the left of the card slot. Now plug the other end of the cable into a USB port on your computer. Two external drives will show up on your computer. One is for the internal storage on the Mavic Air and the other is for the Micro SD card. If you don't have a card installed, only the internal storage will appear. Given how hard it is to get the Micro SD card out of the drone, this might be the easiest way to transfer the files. How do I format the SD card or internal storage? Once you have your images and video files on your computer and have a second copy backed up to another location, you can go ahead and format the internal storage or Micro SD card. Formatting will erase the files and free up space for your next flight. To do that, tap the Camera Settings icon on the right side of your screen (the three horizontal lines with circles located under the shutter button). Now tap the gear icon at the top right then scroll down. Now select either Format SD Card or Format Internal Storage. 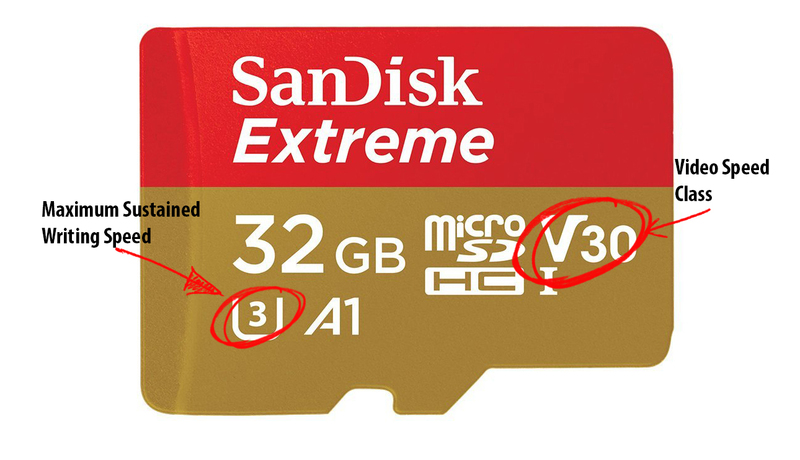 I can tell you from personal experience that Micro SD cards are easy to lose. One of the best accessories I purchased is the SD card case that is pictured at the top of this page. It's made by Pelican. It's small enough to slip into my flight bag easily and is very sturdy. I can keep empty cards on the left and full ones on the right. I'll never lose a card again!